The Garmin Vivosmart 3 is a small fitness tracking device that packs a big of punch. From rep counts to fitness age, this tracker is crammed full of unique features that are sure to please users of all different fitness levels and training desires. The small design of the Garmin Vivosmart allows you to keep track of your fitness and activity levels all day long while not having to compromise on style. The Vivosmart 3 has been created to appear inconspicuous and to look stylish on your wrist regardless of what activities you are engaging in. Similar to previous Vivosmart models, the Garmin Vivosmart 3 tracks heart rate, but this model also bulks up the offerings by creating an easy way for consumers to track their VO2 max, strength-training repetitions, and other various fitness monitoring tools. If you’re interested in purchasing a fitness tracker but aren’t ready to commit to a bulky device you have to wear everywhere, consider checking out this product. The Garmin Vivosmart 3 is the thinnest HR-equipped activity tracker that Garmin offers. It weighs in at 4mm thinner and is more form-fitting than the first Vivosmart HR. In general, the band fits well on just about every adult wrist. The fitness tracking tools offered with this device allows users to continually monitor daily wellness by utilizing its relaxation-based breathing timer that tracks stress and keeps consumers aware of moments in their day when it would be beneficial to sit back and relax. I know I can use all of the help I can get to remember to keep my busy days in check. The Vivosmart 3 also as automatic activity tracking. Users don’t have to worry about turning on any settings to ensure that their movements are always recording. Some of the tracking capabilities include recording steps, floors climbed, intensity minutes, and calories burned. A key feature that sets this activity tracker apart is its Move IQ technology. Through the Move IQ system, Garmin claims that your exercises will automatically be detected. Users do not have to let the tracking know what type of physical activity they are engaging in. The system can differentiate between walking, swimming, cycling, and elliptical training without you having to worry about hitting any extra buttons or taking the time to program in physical activity information. When you purchase this product, you will receive the Vivosmart 3 activity tracker, a charging/data cable, and an owner’s manual. Once purchased, you pair the watch up with the Garmin Connect app so that you can easily store and monitor all of your daily data. This product comes at an attractive price point for many consumers. This product is excellent for anyone with an active lifestyle who wants the convenience of putting on their fitness-tracking device and then not having to think about it again. The Vivosmart 3 is waterproof so that you can leave it on during showers and swimming. I know that in my busy life it is great to have a device that I can just set it and forget it. For its small size, the Vivosmart 3 does a fantastic job with offering a variety of different daily movement tracking activities. It’s geared more for functionality than for style though, so if you are someone who is looking for a product that looks and feels like a watch and that just happens to have some fitness-tracking capabilities, then this product may not be the right fit for you. The design of this device is comfortable and low-key. The Vivosmart 3 is small enough that it easily blends in with just about any outfit, and the band is small enough that it feels light and almost unnoticeable when engaging in physical activity. Unlike many other fitness trackers on the market, the touchscreen of the Vivosmart is well made. This device has a vertical screen that efficiently responds to simple swipes and touches. Even if there is moisture on your fingers, the touchscreen still responds very well to light touches and continually has a great deal of accuracy. Affordability is another attractive feature of this tracker. For a product that accurately measures workouts and sleep activity, stress-levels, and rep counting, this is an excellent purchase for anyone who is looking to begin their journey into living a healthier lifestyle. This product does not have a built-in GPS tracking capability, and can’t even connect to the GPS on your phone. The Vivosmart does have a feature where it can monitor stride length, so if you are willing to take the time to program your stride appropriately, this could be a workaround for the GPS downfall. Although the display screen will alert you to call and text notifications, this tracker does not have the capability of responding to them. Due to the vertical display, the messages that do come through can appear quite choppy and may not adequately represent all of the components of the alert. The poor alert display can be inconvenient for anyone who needs to send off a quick reply message while they are in the middle of their workout. The design of the Vivosmart 3 is fantastic for individuals who are new to the fitness-tracking scene. The watch does not take a great deal of programming to get it up and running so that it is ready to count your activity levels like steps, floors climbed, strength-training reps, and more. This product comes complete with an automatic sensor that automatically tracks heart rate during all parts of the day, not just during a workout. This device is compatible with iPhone, Android, and Windows smartphones and uses Bluetooth and ANT+ to sync up. Additional smart features that come with this tracker include notification alerts, weather updates, music controls, and Find My Phone or Find My Watch capabilities should something be misplaced. This product has smart activity tracking tools that are simple to use. The wrist-based heart rate monitor is in the background working 24/7 without you have to go in and program any settings. The MOVE IQ technology also eliminates the need for you to go into the tracking system to let your device know what type of physical activity that it is going to track. The VO2 technology helps you to assess how strenuous the workout was that you just completed and also gives an in-depth glimpse into the current state of your physical fitness. The Vivosmart 3 also monitors the times throughout the day that you are resting, and will alert you to moments when you may be experiencing too much stress and should take steps to calm your body and mind. Smart Notifications & Smart Features: The display screens allow you to stay on top of email, text, and social networking notifications as they roll in. The device also automatically uploads information to Garmin Connect so that you don’t have to worry about making sure you remember to submit data into a separate database. The automatic upload is excellent for anyone with a busy lifestyle who is continuously on the go and doesn’t have time to be updating and monitoring their fitness tracker constantly. Continual Fitness MonitoringThe Elevate wrist-based heart rate monitoring technology allows users to get a glimpse into their current fitness level. The VO2 max technology is the same tool used by professionals to determine endurance capacity that takes place during prolonged exercise sessions. The daily tracking even has a tool that compiles information to determine your fitness age, and over time, this age can lower as you gain strength and stamina. Constant Wellness Monitoring: Heart rate variability (HRV) is used to help calculate your stress-levels throughout the day, even when you’re not engaging in physical activity. When the digital display shows that your levels are going up, it is an indication that your stress levels are rising. External physical and emotional factors can all play an influential role on your stress level, so this monitoring system comes in handy when you need an extra reminder to stop what you’re doing and to recognize that you need to find an outlet to relieve unhealthy levels of stress. Rep Counter: Traditionally, fitness-tracking devices have been extremely popular with runners and walkers because they do an excellent job recording steps and giving insight into calories burned. If you like to switch up your routine every once an awhile and engage in strength training, the Vivosmart 3 has a feature that will help you keep track of your weight-lifting repetitions. Battery Life: With standard use, the Vivosmart can be counted on to last for up to five days without needing to be charged. The long-lasting battery is a significant step-up from some very similar products that are available on the market. Charge time is also relatively quick; many users report only charging their fitness band for around one hour. 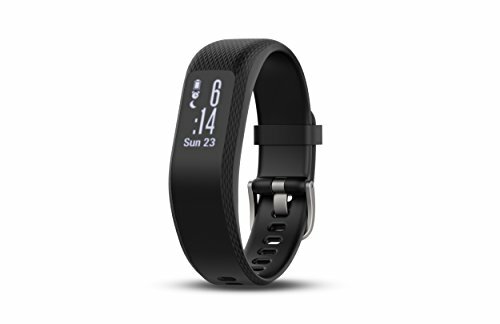 In many of the Garmin Vivosmart 3 reviews on Amazon, consumers are raving about the quality of the tracking components that this product offers at such an affordable price point. Users seem to love that this band is lightweight and comfortable to wear during all daily activities. For people who are looking to get serious about tracking their health and fitness levels, but may not be looking for all of the bells and whistles offered in some more advanced options that are available out there, the Vivosmart 3 seems like a great buy! While many of the reviews of this product are positive, a few customers have had issues with syncing their Vivosmart with the Garmin Connect app. There are some areas that this problem could be stemming from, so it’s hard to pinpoint an exact problem origin. Some people have found that the app can seem confusing and cluttered. Alternatively, synching issues may just be coming from Bluetooth connectivity issues that are not too hard to fix. Overall, if you go out and try to find a Vivosmart 3 review, you will probably see that customers are delighted with their purchases. With a little troubleshooting and reading of the instructions manual, almost anybody should be able to figure out how to properly use this gadget without too much hassle or confusion. Most users find that this tracking device has all of the tracking capabilities that they need. A significant number of reviewers have stated that they have great success with the accuracy of the tracking technologies. This product is an excellent buy for anyone who has basic fitness monitoring needs. Wearing the Vivosmart 3 is comfortable and easy because it can withstand almost any activity that you put it through. Most people will find that the smart tracking capabilities that come with the Vivosmart are sufficient for their needs. The stress monitoring and fitness age indicators are unique features that devices from other competitors do not offer. If you’re looking to start taking real, actionable steps towards monitoring your daily fitness goals, the Garmin Vivosmart 3 is a great purchase. The price point is relatively low, so you can kick-start your health journey without making too much of a financial investment.